Rectangular Trampolines VS. 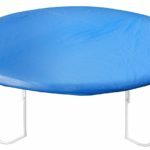 Round Trampolines - Which Should Choose? Trampolines come in all shapes and sizes. The two most popular shapes are round and rectangle. You may think that at the end of the day, a trampoline is a trampoline, but there are some distinct differences between these two shapes that extend far past the way they look. Each shape has a different purpose, and both have their own sets of pros and cons. 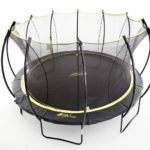 Some families will find that a round trampoline best suits their needs, while others are more interested in the unique perks that a rectangular trampoline offers. Start considering who will be using the trampoline and the way they’ll be using it, and tally up the pros and cons about each potential purchase. If you’re purchasing it for your children, talk to them about what they want to do on their trampoline and narrow down the list together. Round trampolines are essentially the traditional shape. They come in diameters as small as 7 feet and as large as 16 feet. When you picture a trampoline in your mind, you probably see the iconic round trampoline. These models are designed to pull jumpers back toward the middle of the jump pad, where the center of gravity is located. The design is simple, and it’s made to encourage children to get active while having fun. 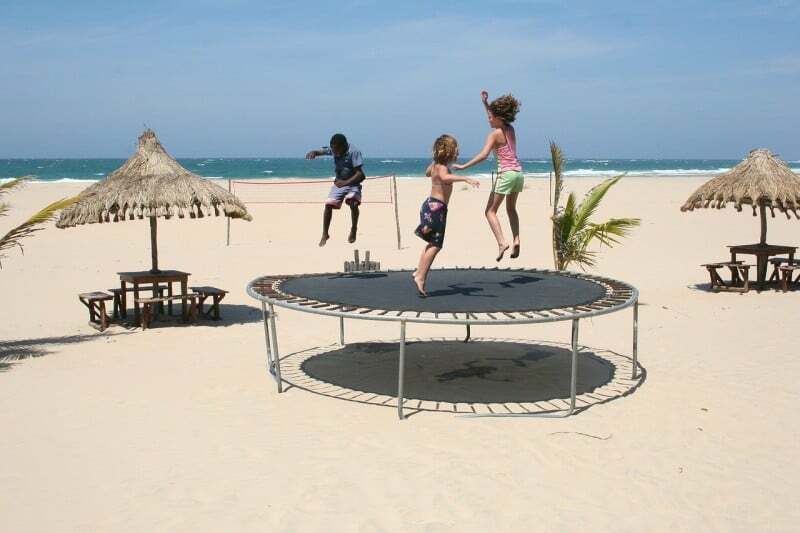 Round trampolines are the most common design, and are therefore the least expensive. 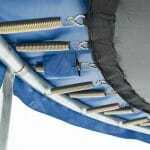 While luxury variations of round trampolines do exist, you can always find trusty and reliable budget models of round trampolines. Less expensive trampolines are always a better option for families who won’t be able to use their trampoline year round due to harsh winters or storms. Round trampolines have their center of gravity right in the middle. As jumpers bounce, they’re pulled back toward the middle. These keeps energetic children from getting too close to the edges, and prevents them from falling off. While all trampolines should be used with a safety enclosure net, this is an added safety feature that most parents will appreciate. Since round trampolines are bestsellers, you’re more likely to find different variations of styles. Some of them come with games and attachments built in for extra fun. Some come with unique frames that don’t feature the springs near the jump pad, and some come with gapless enclosures for maximum safety. Round trampolines come in some of the smallest sizes. If you don’t have a lot of space to put a trampoline in your yard, you can always opt for a modest 10 foot diameter. Since the bounce comes from the middle, the trampoline doesn’t necessarily need to be large to be fun. It can be hard to find a place to put a large diameter round trampoline. Since they’re circular, they don’t do well against the sides of houses or nestled into corners. You’ll need to find enough open space to encompass the diameter of the trampoline, and this space is ultimately larger than the diameter of the trampoline itself. Since the bounce is its strongest in the middle, side bounces are a little weaker. Jumpers can’t get as much lift height around the perimeter of the trampoline, stifling their potential to reach great heights. While this may be a downer for users, a lot of parents actually consider the lower bounce to be a safety feature. Rectangular trampolines are a little more expensive, but you’re paying for some bonuses capabilities you wouldn’t get with a round trampoline. Rectangular trampolines are used by Olympic gymnasts and professional athletes for training because they allow for a strong, high bounce over the entirety of the jump pad. Because the jump pad is rectangular, it allows for jumpers to run and bounce into a trick, such as an aerial spin or a flip. These are designed for serious jumping enthusiasts, and will allow you jumpers to do virtually anything. A rectangular trampoline is nearly limitless. Rectangular trampolines offer the largest jumping spaces. 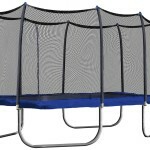 This is great for families with multiple children who may want their own space on the trampoline. 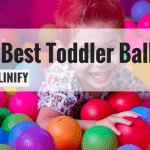 There’s more space for bouncing, running, and doing tricks. Games like basketball or volleyball on a rectangular trampoline are much easier, because the space allows the trampoline to be divided like a court. Rectangular trampolines fit beside a house or a long a fence better than round trampolines do. It’s easier to level a rectangular patch of ground and place a rectangular trampoline in a large yard. Bounces are much higher on a rectangular trampoline. Double flips and running cartwheels are easier, as the entire surface rebounds evenly. In a round trampoline, these tricks are only possible in the center. Having the entire area provide an excellent exercise opportunity allows for more physical activity and a better workout. This can help your kids stay healthy and active. Because rectangular trampolines offer the highest jumps, they’re better for professional use. If you worry about your children getting a little too rowdy, you may not want to get a rectangular trampoline. A safety enclosure net will help prevent your children from bouncing off the mat, but there’s almost no limit to the height they can jump. 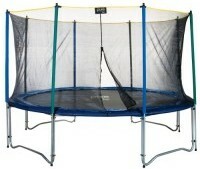 Rectangular trampolines are more expensive. 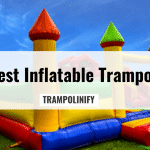 They’re often larger, and constructed to be much sturdier than a round trampoline. You’re paying a premium price for a premium quality piece of athletic equipment, although it is exactly as much fun as it is healthy to bounce on a heavily rebounding surface. 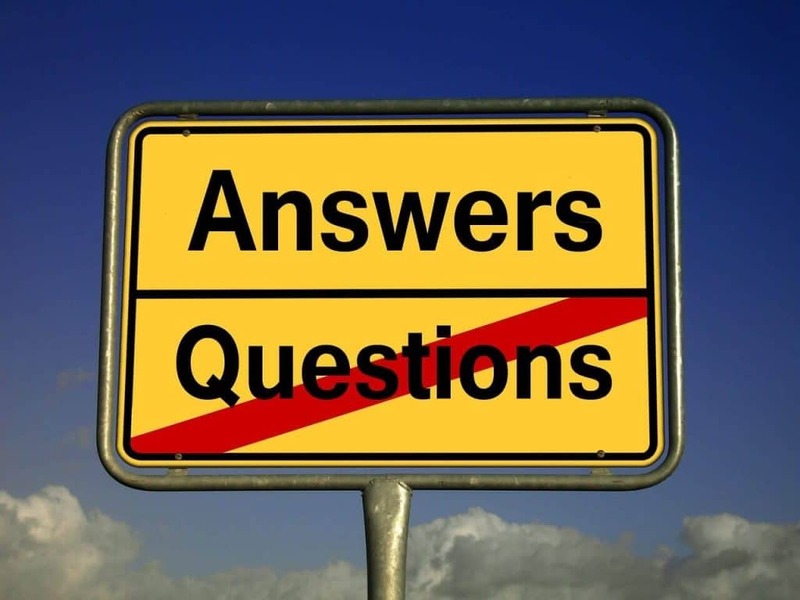 Who Should Use a Round or Rectangular Trampoline? If you’re looking to narrow down the big choice, you’ll have to consider what these differences mean for your family. Think about the ages of your jumpers and the way they’ll use the trampoline. The size of your children, as well as their athletic ability, can have a huge impact on which design you should choose for your back yard. There are some scenarios in which round and rectangular trampolines are interchangeable, but if you’re looking for specific benefits, you’ll need to be sure you’re selecting the right shape. Children 6 and under are just learning their athletic ability. They aren’t ready to play rough, and they need a trampoline that’s optimized for safety. For little kids, a round trampoline is always better. Many small round models exist with padded enclosures and gapless spring pads to help keep toddlers and youngsters contained while minimizing the risk of injury. A rectangular trampoline as too much open space and an unsteady surface, making it an unwise choice for children who have not yet mastered balance. 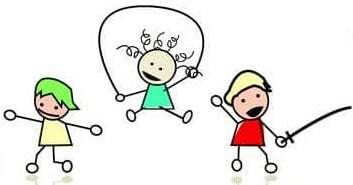 The majority of children ages 6 to 12 are small enough to have just as much fun on a round trampoline as a rectangular trampoline. Round trampolines are a little safer for new jumpers and children in elementary school, so it’s hard to go wrong erring on the side of caution. A major exception would be children who are already involved in athletic activities, such as gymnastics or soccer. These children are probably athletically skilled enough to handle a rectangular trampoline with minimal risk of injury. Teens 13 and up can use a rectangular trampoline, but they’re taller and occupy more space. 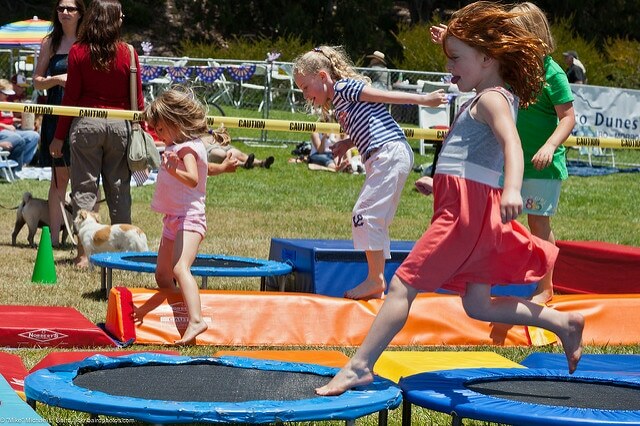 A rectangular trampoline may be a little more comfortable, allowing for multiple jumpers who are older and taller to bounce together without colliding. Teenagers like to do tricks on trampolines, and rectangular trampolines offer enough bounce and space for a running start. 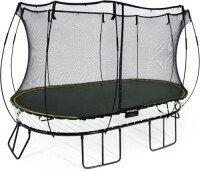 If your teenagers want to do somersaults in the air, they’ll probably need a rectangular trampoline. Adults who want trampolines are almost always purchasing them as a means of getting in a fun workout. 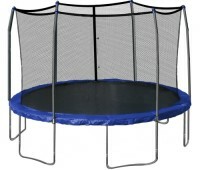 Round trampolines are designed for leisurely jumping, and rectangular trampolines provide a better exercise experience. With a rectangular trampoline, two adults can work out at the same time without being pulled together in the center. Adults are too tall to share a round trampoline, and are more likely to collide in the middle. You can’t go wrong with a round trampoline in most cases. Almost everyone will be able to use it, even if only one jumper can bounce at a time. If your kids plan to use this trampoline casually when they get home from school or they’re playing with their friends during the summer, a round trampoline is a safe choice that’s sure to pay off. 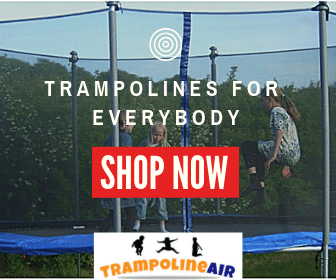 If your primary motivation for purchasing a trampoline is to promote exercise and the development of athletic skill, you want a rectangular trampoline. These are used for professional training, and will allow you to harness the same technology that world renowned athletes use. It’s a full body workout that burns calories and tones muscles at the same time. Think about who is going to be using the trampoline, and how they want to use it. Round and rectangular trampolines are entirely different pieces of equipment with minimal overlap in their intended use. There’s a perfect fit for everyone.